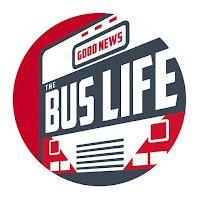 I know this will be hard for our die hard fans to believe but after months of silence I am posting an update on the goings on of the Goods News Bus. As you already know we came up to Canada for a short visit with family. Believe it or not WE ARE STILL HERE! Not long after arriving we had an opportunity to do some ministry while we were here. Bringing the "Good News" is what we like to do. We are actually starting a ministry work in the local city here. Not long ago we were featured in a local newspaper that covered what we were doing. We have a full band and my brother in-law who has studied the hot topic that is Creation vs. Evolution gives a great presentation on the issue. This and other things make for a great ministry night that we are doing once a month. So for now we are in Canada for an unknown amount of time. As far as The Good News bus is concerned. The winter was very harsh and I was not prepared for the cold. I had some pipes crack all of which are now fixed. We are moved back into the bus and enjoying it. It is like the Hilton on wheels. That may be a slight exaggeration but it is really nice.